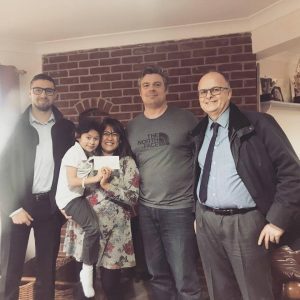 On the 6th February 2019 The Walker Construction Trust made their first charitable donation to Maya Nash. Maya is a strong, tenacious girl, who knows what she wants and loves nothing more than playing with her baby dolls, or being outdoors and jumping on her trampoline. As the youngest child, she likes to boss her siblings around and dreams of becoming a paediatric doctor when she grows up. But tragically, when she was only three years old, Maya was admitted to hospital and diagnosed with stage four high-risk neuroblastoma, a devastating and aggressive childhood cancer that affects only around 100 children in the UK each year. She’s been through so much treatment to get well again but her battle with cancer is far from over. High-risk neuroblastoma returns in almost 50% of children and when it does, the chances of long-term survival drop to less than 10%. Now Maya’s family desperately want her to access treatment that could help keep her cancer away. They are urgently appealing for £243,000 by 21 February 2019. “There were virtually no signs at all, just unexplained lethargy and a persistent fever which was always seen as a ‘viral infection’,” says Dellanie. After ten weeks of uncertainty surrounding Maya’s health, Dellanie and Terry heard the words that would change their lives. ‘Your child has cancer’. Maya was diagnosed with stage 4 high-risk neuroblastoma in her left adrenal gland. “It was so overwhelming and gut-wrenching. Every parent’s worst nightmare. We were told if her tumour had been left untreated that she would have only had a few weeks to live,” continues Dellanie. 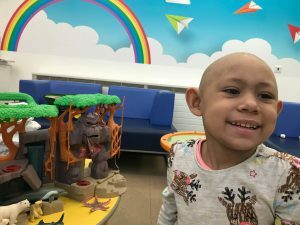 Over a 20-month period, Maya endured ten cycles of chemotherapy, stem cell harvest, surgery, stem cell transplant, high-dose chemotherapy, radiotherapy, differentiation therapy and immunotherapy. She also had countless injections, blood and platelet transfusions and general anaesthesia. She really went through the mill, and her beautiful brown hair fell out. Maya’s mum, Dellanie, describes the time as ‘harrowing’. “As well as mucositis, Maya suffered from haemorrhaging, horrendous nosebleeds and VOD (veno-occlusive disease) of the liver,” says Dellanie. She and Terry suffered as parents too. “We didn’t realise then how completely exhausted we were as parents. Just imagine the pain of watching your child go through this; putting on a brave face for your child when you don’t always feel that strong,” says Dellanie. Fortunately, the family had great support. “We are forever indebted to all the wonderful people, and the excellent NHS team looking after our precious girl Maya,” says Dellanie. Maya has recently come to the end of her frontline treatment, and despite ‘hot spots’ evident on her October 2018 scans, doctors don’t think it is active disease. This means that there’s no further treatment planned in the UK. 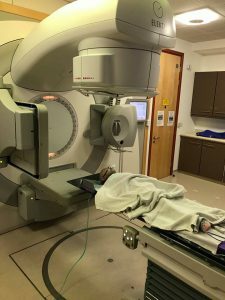 Knowing how aggressive Maya’s cancer is and the high relapse rates “as oncology parents, we are not comfortable accepting a wait-and-see approach,” says Dellanie. Maya’s family are hoping Maya can access the Bivalent Vaccine clinical trial at the Memorial Sloan Kettering Cancer Centre in New York, to try to increase the chances of the cancer staying away. This treatment is not available in the UK. Maya’s family desperately need your help to keep her cancer away so they are urgently appealing for funds. They need to raise £243,000 by 21 February 2019. There are many ways you can help Maya: by making a personal donation; holding a fundraising event; getting sponsored to take on a challenge. You can make a donation via this page, or if you’d prefer to text donate, text MYNA99 and your amount £1-£10 to 70070. If you’d like help support Maya’s campaign, please contact their fundraising team on 0207 284 0800 or fundraising@solvingkidscancer.org.uk. Please continue to share Maya’s story to raise awareness. Thank you. The Walker Construction Trust are proud to support local causes and individuals in desperate need of funding. Trustee, Steve Walker comments “I have to say it was a very humbling experience and it makes you realise how lucky we all are. The family will keep us posted on Maya’s treatment. This case is what I believed the trust should be for, I am so pleased we could help in some small way.” We thank you for your ongoing support.